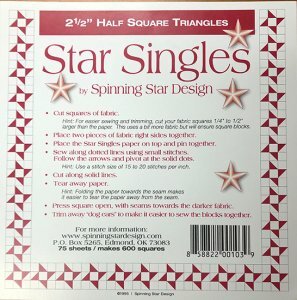 2-1/2 Triangles - Star Singles [250TR] - $10.00 : Animas Quilts Publishing, Quilt Patterns, Books, Fabric and More! Star Singles Triangle Paper allow you to make PERFECT half square triangles every time. You select the size needed by it's 'finished' size after it's stitched into your project. I can't imagine making half square triangles without the accuracy of this paper.